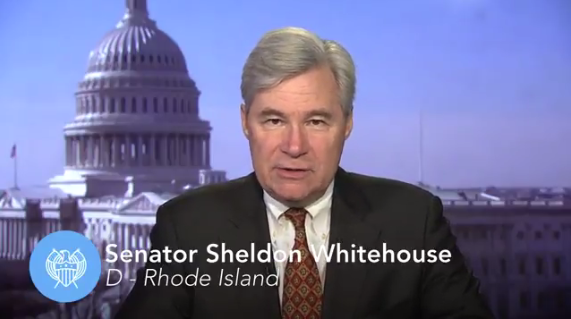 The Weekly Democratic Party Address was delivered by Senator Sheldon Whitehouse of Rhode Island. Transcript is not available because the Senate Democrats don’t have a useful press office. Leader Pelosi. Good morning, everyone. Welcome back. As I said, over the break, our country observed the 50th anniversary of the assassination of Reverend Martin Luther King Jr. Today in the Capitol, we will have an observance under the leadership of the Speaker, which I am honored to participate in. I am reminded, in the course of the debate on the tax bill and on the budget, and now the so-called balanced budget amendment, of Reverend King’s words: ‘God never intended for any group of people to live in superfluous inordinate wealth, while others live in abject deadening poverty.’ That seems to be a course that this tax bill, which gives 83 percent of the benefits to the top 1 percent, which will tax the middle class to the tune of 86 million people in the lifetime of the bill, which increases the national debt by over $2 trillion, and that $2 trillion is the engineering of their undoing of Medicare and Medicaid and Social Security. We have seen that in the President’s budget – the beginning of all that, and now in the so-called balanced budget amendment. The balanced budget amendment is in no way balanced in terms of values and how we invest in our future to keep America number one in every respect. The GOP – now it is my words, end of quote – the GOP tax scam mortgaged the future of our seniors and their families and our children in order to give even more money to Wall Street, pharmaceutical companies, big corporations and the wealthiest 1 percent. Now Republicans have the chutzpah to bring forth a balanced budget amendment, engineered – this is engineering, budget engineering – to force devastating cuts to Medicare, Medicaid and Social Security. Republicans want America’s seniors to give up one of the pillars of their health and economic security, retirement security, to pay for GOP giveaways to the wealthiest. So we will be having that debate on the Floor today. It is absolutely going nowhere. You know, it needs a two-thirds vote on the Floor today, which it will not get, and then it needs three-quarters of the states to ratify it, so I don’t even know – it won’t get two-thirds today. So, again, what else is happening this week? And every minute it changes. We have seen the President dangerously escalate his threats against the Special Counsel. President Trump’s disparagement of Special Counsel [Robert] Mueller’s investigation as, the President says, as ‘an attack on our country,’ is a new low, even for President Trump. This investigation has made clear that the Russians perpetrated a strategic attack on the 2016 elections to support the Trump campaign. The Special Counsel has handed down multiple indictments and secured guilty pleas of Trump campaign officials in connection to Russia’s meddling. If the President fires Special Counsel Mueller, or Deputy Attorney General [Rod] Rosenstein, it will ignite a constitutional crisis. It would declare that President Trump believes that his Administration and his campaign are completely above the law. House Judiciary Democrats, led by Ranking Member [Jerrold] Nadler, have introduced a companion to the bipartisan Senate legislation to protect the Special Counsel’s legislation. That is Nadler, Jackson-Lee and Cohen legislation in the House. The Special Counsel must be allowed to follow the facts unhindered. Almost every week, we see new evidence of the Trump Administration’s culture of corruption, cronyism, and incompetence. At EPA, Administrator Scott Pruitt has displayed a staggering ethical blindness. President Trump must fire him. Pruitt’s abuses of office are representative of an Administration that uses a powerful position to enrich themselves and their friends. And in the case of Pruitt, who pays? His policies are about depriving our children of clean air, clean water, clean drinking water, food safety, just complete disregard for the responsibility of the Environmental Protection Agency, and there for the benefit of his rich friends. As you know, multiple members of the Cabinet, of the Trump Cabinet, are under federal investigation for graft, corruption and sticking taxpayers with multimillion dollar bills for their extravagant and lavish lifestyles. Republicans in Congress must end their complicity in all of this, and finally take action to hold this administration accountable for its abuses. You may know, you may not recall, but some may recall that in 2005, 2006, one of our mantras during the campaign was to drain the swamp, to end the Republican culture of cronyism, corruption and incompetence, and that is exactly what we did. The President has misappropriated that term of art ‘drain the swamp,’ and what does he do but have an Administration that is wallowing in it. Pelosi Remarks At Commemoration of the 50th Anniversary of the Assassination of Dr. Martin Luther King, Jr.
We gather here in Statuary Hall beneath Clio, and her clock. Clio is the muse of history and men and women in these hallowed halls are a part of history. Clio is there to judge, that our words and action would face the judgment of history and that we are a part of the long and honorable heritage of our Democracy. Dr. King was a singular man, an exemplar of exceptional faith and vision, a clarion voice for thundering moral righteousness. That tragic day in Memphis the world lost a great light and justice. As we celebrate Dr. King’s life, we also honor the workers, men and warriors who marched and fought for justice with him across the nation, including another one of our guest speakers today. An inspiration to the Congress, Congressman John Lewis, whom you will be hearing from shortly, whom I did not want to follow. In the 1950s the Kings, Coretta Scott King and Reverend Martin Luther King Jr. traveled to India to study Mahatma Gandhi’s principles of non-violence, so they could apply them to the civil rights struggle here at home. In Sanskrit the word for non-violence, ‘satyagraha,’ has two meanings. It means non-violence and it means insistence on the truth. Insistence on the truth and non-violence. Though they knew it would mean sacrifice and struggle for their family, and for many others across America, the Kings would insist on the truth at the heart of our nation. That truth, that we hold these truths to be self-evident that all men are created equal. Dr. King insisted on that truth at lunch counters, marches and churches. He insisted on that truth of his dream. A dream of equality and opportunity for all regardless of race, gender or creed. He insisted on the truth of economic justice when he said, ‘God never intended for one group of people to live in superfluous inordinate wealth, while others live in abject deadening poverty.’ He insisted on the truth of health care as a right when he said ‘Of all the forms of inequality, injustice in health is the most shocking and most inhumane.’ Our chair of our Congressional Black Caucus, Mr. Cedric Richmond hears that sentence over and over again by Mr. Clyburn of the House. In the eloquent student leader from Parkland, in our patriotic young Dreamers and the champions of Black Lives Matter and the women who say ‘Me Too,’ the truth of Dr. King’s words ring clearer than ever. On this anniversary, let us stand with these young champions as they demand action and justice in the tradition of Dr. King. And let us honor Dr. King always by standing on the mountaintop, insisting on the truth and advancing the radiant promise of progress for all. As Dr. King said in his remarks, ‘this cannot be in vain.’ We all do know that as we pray for God to bless America, God truly blessed America with the leadership, life and family of Reverend Dr. Martin Luther King. Thank you. “Equal Pay Day reminds us all of the work that remains to realize our nation’s fundamental principle of fairness, and secure equal pay for equal work. American women who work full-time still earn on average only 80 cents for every dollar earned by men. For minority women, the wage gap is even more staggering, with African American women earning only 63 cents and Latinas earning only 54 cents for every dollar earned by white men. “Securing pay equity means securing economic justice and opportunity for all. The wage gap robs women of a total of $403,440 over the course of their careers, making it much more difficult for millions of hard-working women and their families to pay their monthly bills for groceries, rent, child care, and health care. Yet, instead of working with Democrats to close the wage gap and help lift up working families, Republicans have ignored this vital issue and cynically worked to undermine the strength of the middle class. Leader Pelosi: Good afternoon everyone. The votes, as usual, rule our timetable, so forgive me for being a few minutes late. But, we are all here to raise our voices against the Republicans’ cynical balanced budget constitutional amendment, and their brazen attacks on Medicare, Medicaid, and Social Security. We are very honored that Lisa James Henson is here, and perhaps Lucila Torres will be here as well, to share their stories with us. I am very proud to be here with the co-chairs of our Senior Task Force, Congresswoman Jan Schakowsky and Congresswoman Doris Matsui. Of course we are always honored when the Ranking Member of the Budget Committee can join us and can speak with some great authority on the fact that a budget is supposed to be a statement of our national values. What is in it should be a statement of what is important to us as a nation. As they go forward and call this a so-called ‘balanced budget amendment,’ it is not balanced and it should not be an amendment to the Constitution. As we all know the Republicans have these tax cuts for the rich, 83% of the benefits going to the top 1%. Eighty-six million middle class American families will be paying more taxes in the life of the bill. What is important is it increases the deficit, when you add in the interest of the tax cut for corporate America of $2 trillion, which adds to the deficit. So they make no mistake. As soon as they passed their bill, the President put forth his budget with cuts to Medicare, Medicaid and Social Security disability benefits. And now they want to codify a political ideology. They want to pass this balanced budget amendment which attacks the fundamental promise of dignity and security for America’s seniors and working families: Social Security, Medicare, Medicaid, pillars of health security for America’s families along with the Affordable Care Act. All along the Republicans have fought to destroy those bedrock guarantees of our democracy. America’s seniors deserve so much more. I always like to have sessions with college students, high school students and the rest to hear what they think about the future. And when they talk about what some of their priorities are, they always talk about Medicare, Medicaid and Social Security because they know what it means to their families. They know that their parents do not have to take responsibility for their grandparents, that they can invest in the next generation. They see the connection, they see the family tie. House Democrats are pushing back against the Republicans plan to pay for their huge deficits by cutting retirement security. On Thursday, Speaker Ryan and House Republicans forced a vote on a radical Republican balanced budget amendment to the Constitution that brazenly attacks Medicare, Medicaid and Social Security – abandoning America’s seniors and working families. – Cut Social Security by $2.6 trillion through 2028. – Cut Medicare by $1.7 trillion through 2028. – Cut Medicaid, CHIP, and ACA subsidies by $1.2 trillion through 2028. – Cut Veterans’ disability compensation and other benefits by $250 billion through 2028. After exploding the deficit by nearly $2 trillion with the GOP tax scam and its massive handouts to big corporations and the wealthiest 1 percent, Republicans are now shamelessly demanding that seniors sacrifice their retirement security to pay for the GOP’s fiscal recklessness. House GOP’s balanced budget amendment is not about budgeting or balance. It’s about Republicans pushing their cruel agenda to further enrich the special interests on the backs of working families. Democrats believe in real fiscal responsibility and continue to fight for America’s seniors and our veterans, to create more good-paying jobs, and to reduce deficits in a responsible and sustainable manner. Q: On the subject of Speaker Ryan’s retirement, I am going to ask you to read the tea leaves, do you think, you know, it suggests anything or reveals anything about what is going to happen this November? Do you think Republicans are worried about holding on to their majority in the House? Leader Pelosi. Yes, they should be, but I hope they are resting and not thinking about it that much. We have – we understand the challenge that is out there, the urgency, and the American people understand the urgency of winning this election. They are willing to take responsibility to do it, in record numbers in terms of mobilizations and marches and the rest, and the courage to run for office. Women have marched, and now they are running, and so, the mobilization, the volunteerism, the candidates willing to run, we feel very confident. When a President is below 50 percent one year before the election, that means he gets the retirements, we get the A-team. That this President one year before the election was under 40 really means it is going to be a very good year for us, but we put one good day in front of another, one good week in front of another, and just so you know, it is 28 Tuesdays until the election. And this reminder: “It is 28 Tuesdays until the election.” We can’t afford to rest. Here are the Republicans who voted to steal our retirement and health care money in order to pay for Republican tax cuts.